Wat Bowon Niwet was constructed in 1829 . 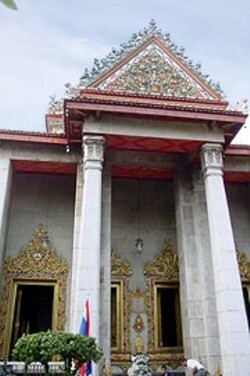 The temple combines Thai and Chinese artistic elements . It locates on Phra Suman Road in the Bang Lamphu area (Bangkok). There is in the shrine-hall of Phra Phutthachinnasi, a very beautiful Buddha image which was molded in 1375. King Rama IV used to be a chief abbot of this temple before he ascended the throne.